Queen Marie Amélie bi Winterhalter. In Palermo on 25 November 1809, Princess Maria Amalia mairit Louis Philippe d'Orléans, (exiled) Duke o Orléans (son o Philippe Égalité an a cousin o Louis XVI) An as a result Marie Amélie Duchess o Orléans. In the first years o their mairriage the couple lived at the Palazzo Orléans in Palermo. Ferdinand Philippe o Orléans, Duke o Orléans (3 September 1810 – 13 Julie 1842) mairit Helene o Mecklenburg-Schwerin an haed childer. Louise o Orléans (3 Aprile 1812 - 11 October 1850) mairit Keeng Leopold I o Belgium an haed childer. Marie o Orléans (12 Aprile 1813 - 6 Januar 1839) married mairit Duke Alexander o Württemberg, haed childer. Louis o Orléans, Duke o Nemours (25 October 1814 – 26 Juin 1896) mairit Victoria o Saxe-Coburg an Gotha an haed childer. François o Orléans, Prince o Joinville (14 August 1818 – 16 Juin 1900) mairit Princess Francisca o Brazil an haed childer. Françoise o Orléans (26 March 1816	- 20 Mey 1818) died young. Clémentine o Orléans (6 March 1817 – 16 Februar 1907) mairit Prince August o Saxe-Coburg an Gotha an haed childer. Charles o Orléans, Duke o Penthièvre (1 Januar 1820 – 25 Julie 1828) died young. Henri o Orléans, Duke o Aumale (Januar 16 1822 – Mey 7 1897) mairit Princess Carolina Augusta o the Twa Sicilies haed childer. Prince Antoine o Orléans, Duke of Montpensier (31 Julie 1824 – 4 Februar 1890) mairit Infanta Luisa Fernanda o Spain an haed childer. 26 April 1782 - 25 November 1809 Her Ryal Highness Princess Maria Amalia o Naples, Princess o Siciliy. 25 November 1809	9 August 1830 Her Ryal Highness The Duchess o Orléans. 9 August 1830 – 24 Februar 1848 Her Majesty The Queen o the French. 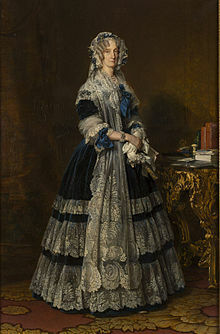 24 February 1848– 24 Mairch 1866 Queen Marie Amélie. This page wis last eeditit on 13 Apryle 2019, at 21:28.